It’s been so hot in Montreal lately, the perfect weather for linen dresses. This is the Jump Rope Dress (view B) by Oliver + S. The shirtwaist dress features cuffed sleeves, gathered patch pockets, collar and front placket. I made view B which has long sleeves and an a-line shape. My daughter is between sizes 3 and 4 at the moment, so I made a size 4, which was a little long and slightly large, but leaves room to grow. The linen fabric doesn’t have a lot of give, so making it larger, rather than smaller seemed like a good idea. As with all Oliver + S patterns, the instructions are great, but this is not a pattern for beginners. Oliver + S patterns are rated by difficulty on a scale of four scissors, and this one gets three. It’s not really a difficult pattern, but it does have a lot of finicky details. It’s made like a proper men’s shirt, minus the collar stand. The instructions for the front placket, for example, take one full page of the pattern instructions. On the other hand, the results were great. I’ll be making another. Seems kid No 1 wants one too. The only change I made was to the hem. 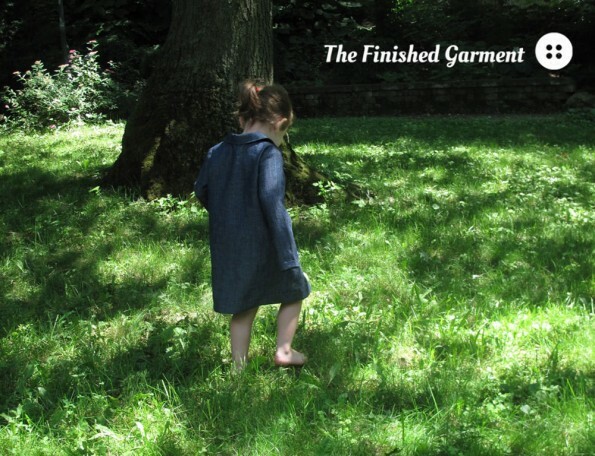 The pattern calls for a narrow hem, but the dress was just too long for my little girl, so I made a wider one that I can always lengthen later. 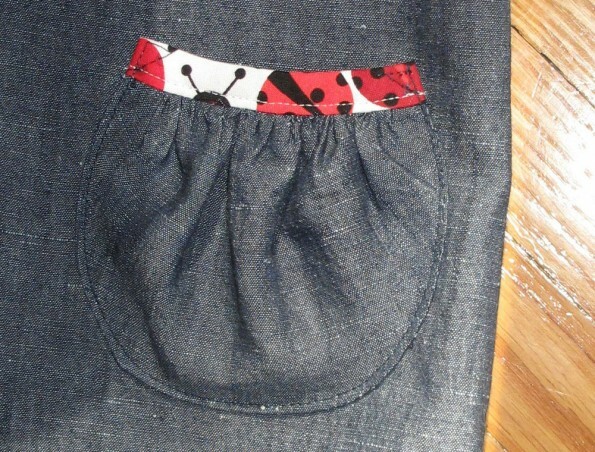 I also used contrasting fabric for the pocket binding and inside front placket. I’ve seen other versions where the entire collar and placket were in a contrasting fabric and that looks really nice as well. Contrast fabric on the inner front placket. 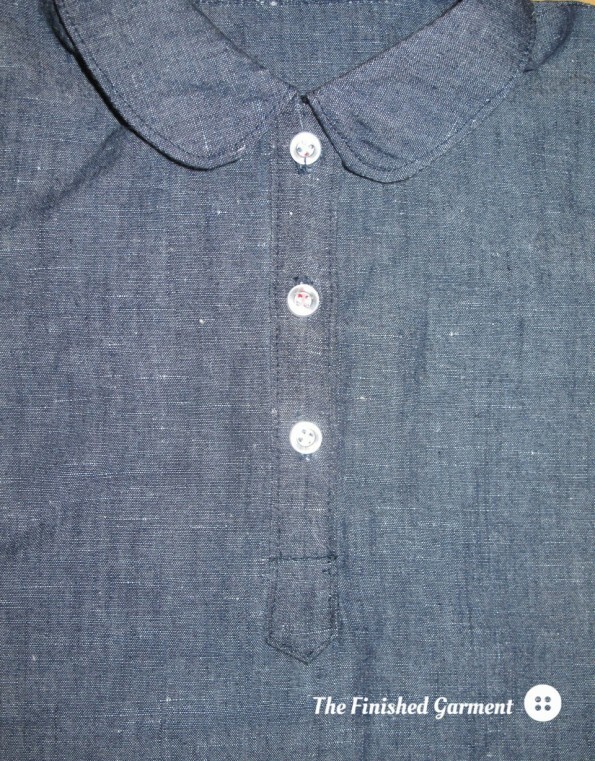 Folded cuffs on the sleeves. I have been hoarding this fabric forever, so it was time to get it sewn up. 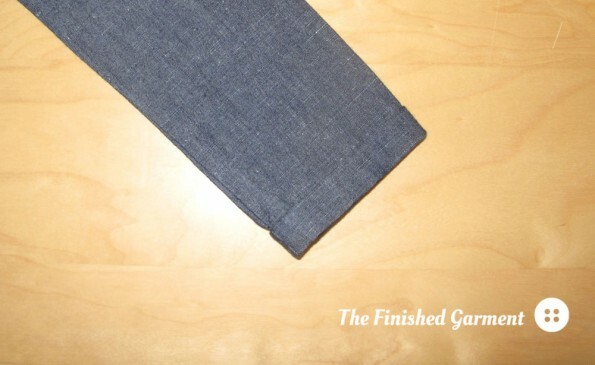 The fabric is a cotton linen chambray in Indigo Washed by Robert Kaufman. It has a really lovely sheen, and the colour is beautiful. 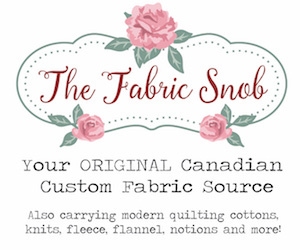 It handles like a linen, which means it’s a little stiff at first, but also stretches a little while sewing. The key is lots of pressing. It has to be my favourite fabric ever. The fabric has a beautiful sheen. I love how this turned out. 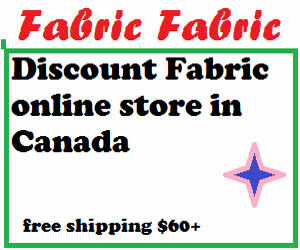 It’s cute and easy to wear, comfortable for the summer, nice enough for school and quite durable. I really love the pockets. Patch pockets with contrast bias binding. 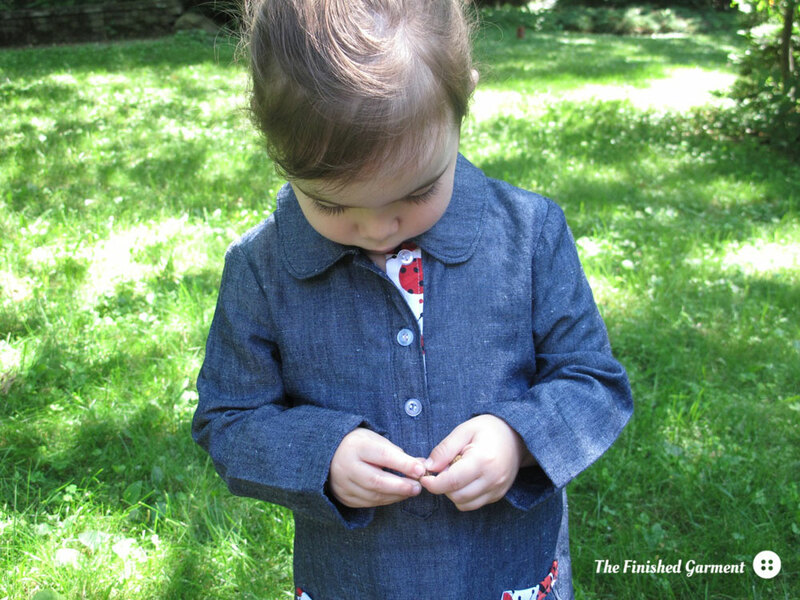 This dress is part of the Kids Clothes Week Summer Challenge and the Stashbusting Sew-Along. 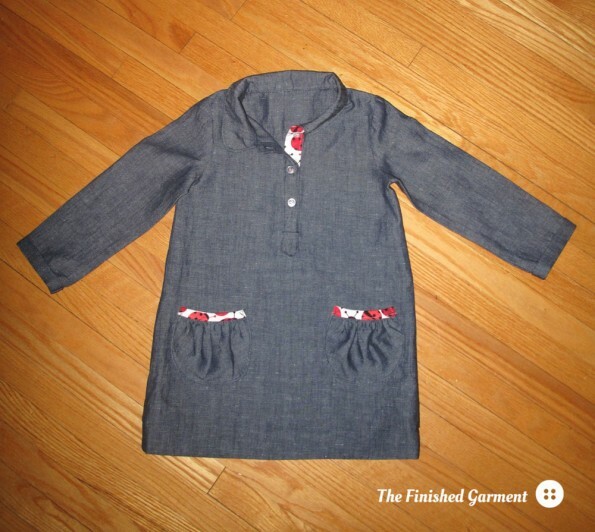 Pattern Review: Jump Rope Dress (view B) by Oliver + S.
Fabric: Cotton linen chambray in Indigo Washed by Robert Kaufman. Sewing Level: Intermediate to advanced. 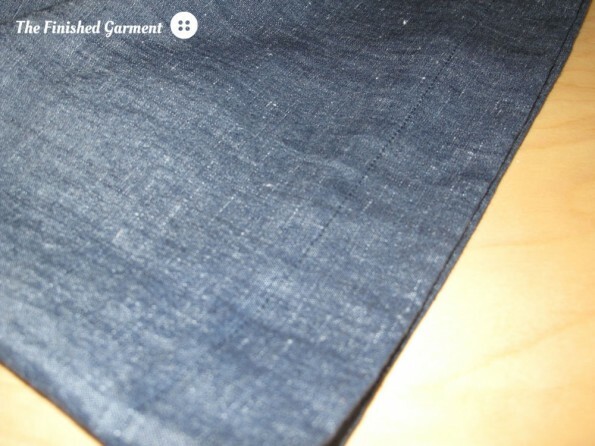 Modifications: I made a wider hem and used contrasting fabric for the pocket binding and inside front placket. Nice work on the plackets! Those are indeed tricky. 🙂 The pockets are super cute. Andrea_R recently posted…Ayla’s quilt – all done! That is such a sweet little dress! And your model! She is just too precious! 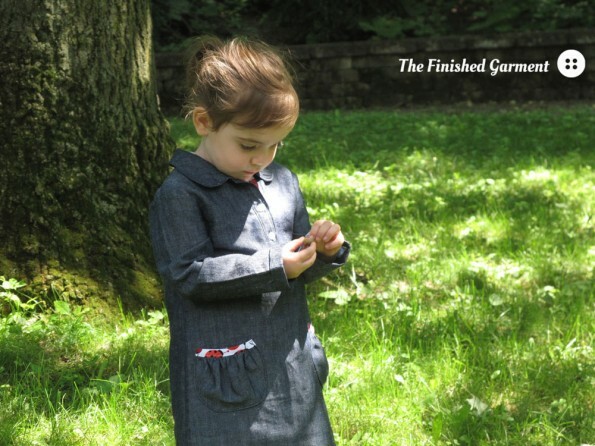 I love the ladybird details and the gathered pockets. It’s always the little things make things so awesome! 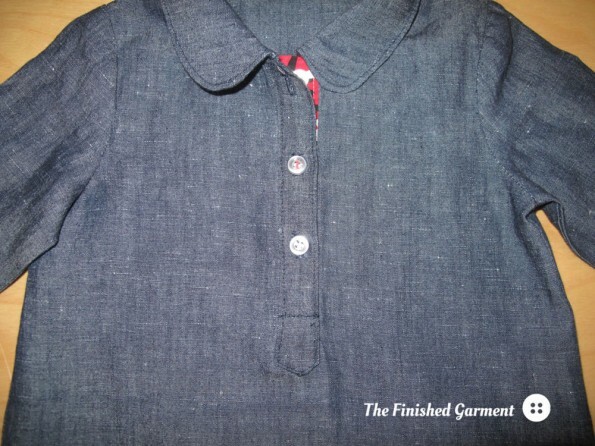 I’ve had my eye on the RK chambray for a while now so glad you gave it the thumbs-up. Should look into getting some in store. 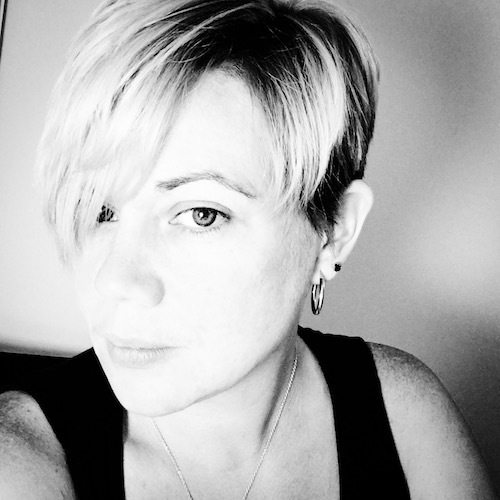 Esmari Taylor recently posted…Introducing Cynthia Frenette of CynthiaF! It is gorgeous fabric. And there are only a couple places that carry it and it is always out of stock. Previous Previous post: Shorts for the Win!